Próximamente traduciremos este interesante artículo al español para que podamos entendernos por aquí. De momento, aquí lo tenéis en inglés. Es que este mundo es muy moderno. From the Order of the Dragon to Dracula Constantin Rezachevici [Professor Constantin Rezachevici is chief researcher at the Nicolae Iorga National Institute of History, a member of the Romanian Academy, and Professor with the Faculty of History at the University of Bucharest. He is author of The History of the Neighbouring Countries and the Romanian People in the Middle Ages (1998).] The name "Dracula" has witnessed periods of both brilliance and fame. It became famous in the second half of the fifteenth century through the actions of Vlad Tepes (Dracula), ruler of Wallachia (1448, 1456-1462, 1476). It has continued to exist, although less known, through his legitimate descendants, the noble family Dracula of Sintesti and of Band, established in Transylvania between the fifteenth and seventeenth centuries. Families that originated from Vlad’s marriage to a close relative of the Hungarian King Matias Corvin in February of 1462 can provide an explanation of the Szekely ancestry wrongly attributed to Vlad Tepes and his literary metamorphosis the vampire Count Dracula. As a result of the novel of Irish writer Bram Stoker, the name "Dracula" has obtained universal fame during the modern epoch. The origin of the name "Dracula" has a very interesting history, very different from what has been commonly believed. For a long time, many theories have existed about its genesis, ranging from the claim by Grigore Nandris that it was the genitive Slavonic form meaning "the son of Dracul" (Vlad Dracul was the ruler of Wallachia from 1437-1442 and 1444-1447) to the false connection with a coincidentally similar Romanian word "dragulea", meaning the dear one or lover. All these theories are connected to the starting point of this name exclusively for Vlad Tepes, until this popular name, meaning "son of Dracul" became confused with the Romanian word "Dracul", meaning "the devil" (Andreescu 149-50). To clarify matters, Dracula (Draculea) has represented from the beginning a new popular Romanian form (from the name Vlad Dracul) applied to Vlad Dracul’s famous son Vlad Tepes (Andreescu 156, Stoicescu 201), while the nickname given to Vlad by the Turks was "Tepes", the Romanian word for impaler. 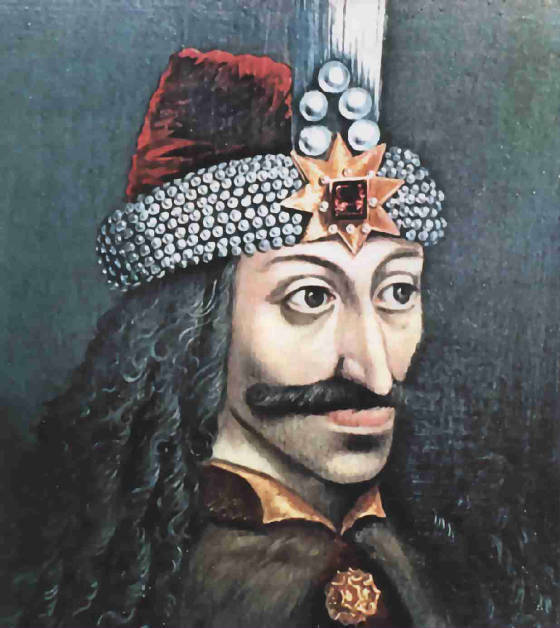 Even before Vlad Tepes’ reign in Romania, the boyar Albu had called Vlad Dracul (which was a nickname known outside of Romania), simply Draculea (Andreescu 150-51), the popular exclusively Romanian name. The Venetian messenger Bartholomeo de Jano and his contemporary Greek chroniclers Leonicos Chalkokondyles and Critobul of Imbros have also called him Draculea (Andreescu 154-55). Even Iancu of Hunedora, who executed him, made mention on December 17, 1456, of "infidelem Drakwlam wayvodem" (Documenta 461). In the end, the Turkish chronicler Asakpasazade, referring to the year 1442, calls Vlad Tepes "Dracula" instead of "Draculea" (Cronici 88), while the Serb janissary who wrote from 1496 to 1501, called him "voievodul valah Dracula" (Calatori 125), which in English means the Wallachian prince Dracula. It is clear that Draculea (Dracula) was a popular nickname for Vlad Dracul, meaning a person belonging to the Order of the Dragon. For his son, Vlad Tepes, the name "Dracula" became through affiliation an alternative, not only a nickname, with the side effect of increasing his bad reputation, with its diabolical meaning, even though originally, in his father’s days, "Dracul" did not have a malevolent meaning. Vlad (the father) had obtained the nickname "Dracul" in connection with his receiving the Order of the Dragon from Hungary’s king Sigismund of Luxembourg, at Nürnberg around February 8, 1431. The German name for this order was "Drachenordens," and in Latin "Societatis draconistarum." The Order of the Dragon, which some confuse with a decoration, was really an institution, just like the other chivalric orders in medieval times. As a model, Sigismund of Luxembourg took the Order of St. George (Societas militae Sancti Georgii) created by the king of Hungary Carol Robert of Anjou (1308_1342) in 1318. Its statute from 1326 requires the protection of the king from any danger or plot against him; the symbol of the Order of the Dragon was a red cross on a silver field and a black mantle. With the exception of the last object, these are also found in the new order. In a battle with the anarchical Hungarian nobles and in the background of the other battles for the possession of Bosnia, Sigismund of Luxembourg and the queen Barbara Cilli created the Order of the Dragon on December 12, 1408, mainly meant to protect the king and his family, with the help of a big part of the Hungarian nobility, led by the families of Gara and Cilli. The statute of this Order of the Dragon, elaborated by the chancellor of the Hungarian court, Eberhard, bishop of Oradea, maintained only in a copy from 1707 and published in a Hungarian edition in 1841, has remained almost unknown, even to the investigators of this problem. The analysis of this important document shows that the order aimed at defending the cross and at the destruction of its enemies, symbolized by the ancient Dragons (Draconis tortuosi) with the help of St. George. The battle was against the Turkish pagan armies and the husits, who were outside the Orthodox nations who were faithful to the cross and to King Sigismund (Romanians etc). Barons, priests and leaders of the kingdom gathered below the sign of the dragon, submitted to the cross and proclaimed loyalty to King Sigismund and the queen. The members who founded the order were 24 nobles of the kingdom, led by the despot Stefan Lazarevici, the leader of Serbia, among whom were Nicolae of Gara, the Hungarian prince, Stibor of Stibericz, the prince of Transylvania, Pipo of Ozora, the Ban (local ruler) of Severin etc, in general great local noblemen. They were all engaged in serving with loyalty no matter the price, the royal couple, their family and their friends. The symbol of the order was, after the statute of 1408, a circular dragon with its tail coiled up around its neck. On its back, from the base of its neck to its tail, was the red cross of St. George, on the background of a silver field. According to the first Medieval encyclopedist, Isidor of Seville, it was a "serpens," a dragon that lives on land. As the years went by, the Order of the Dragon expanded, including two classes, a superior one, whose symbol was a dragon being strangled with a cross stretched out on its back, which, especially from the late fifteenth century to the seventeenth century surrounded a family coat-of-arms. Sometimes foreign members were allowed in, but only as allies, who did not have to take the oath of eternal loyalty to King Sigismund of Luxembourg, for example, the king of Poland, Vladislav Jagiello, his former brother-in-law Vitautas (Witold), the great duke of Lithuania, King Henry the fifth of England, the members of the Italian families Carrara, della Scala and leaders of Venezia, Padova and Verona. During the life of King Sigismund, from 1408 to 1437, the Order of the Dragon became the most important noble political association in Hungary, loyal to the king, the main political force in the kingdom, second to the king. Immediately after being established, it served as a model for the setting up in 1409 of the Spanish order of Calatrava. Into this prestigious European chivalic institution, which was symbolized by the dragon, was admitted the aspirant to the Wallachian throne, Vlad (Dracul) in February 1431, in his position of vassal of Sigismund of Luxemburg, according to the statute of the Order. Admission was into the superior class of the order. The symbol of this class evolved up to 1431 in two phases: the first one, as it has been reminded earlier, was a dragon with a cross drawn on his back, between its wings, from the base of the neck to its tail and lasted from 1408 to 1418; the second one, until the death of Sigismund of Luxembourg, was completed with another cross perpendicular to the coiled up dragon, having on the equal sides of the cross the writing "O quam misericors est Deus" (vertical) and "Justus et paciens" (horizontal). This sign was worn on a sash, like in the portrait of Dichters Oswald von Wallenstein in 1432. The necklace of the order was made of two gold chains joined by the sign, a Hungarian cross with a double bar above the coiled up dragon. But on the seal, another dragon was represented, with a big body, with dented wings, not coiled, only two feet with a free tail, with a very small Greek cross on its chest. Sigismund of Luxembourg himself introduced in 1433 the seal for the Order of the Dragon of this type, one of the last seals he made as a Roman-German emperor. Unfortunately, the symbol that Vlad Dracul had wasn’t kept. But the elements of the symbol of the Order of the Dragon on his royal seal of 1437 clearly show that Vlad Dracul was the possessor of the Order of the Dragon necklace: the Hungarian double cross, instead of the Latin cross; the dragon illustrated on the reverse of the six silver and bronze coins that were beat by Vlad at Sighisoara in Transylvania (or after his occupation of the Wallachian throne) is similar to the dragon in Paolo Uccello’s picture, St. George and the dragon; and the coat-of-arms from the episcopacy built by him at Curtea de Arges. Furthermore, he transformed the dragon from the seal to his personal coat-of-arms, not directly but as an original heraldry composition. This coat-of-arms was carved from stone, and represented the dragon attacking a lion, the headed snake, the dragon, emerging victoriously from this battle, therefore illustrating metaphorically Psalm 90 ("You will step on lions and on vipers and walk over lion cubs and snakes"). This phrase’s purpose was to symbolize the victory of Christianity and that of Vlad Dracul over his enemies. In this case the dragon was a benefic symbol, and the picture of Vlad with his name (Dracul, Draculea-Dracula) had a positive meaning which was only common in Wallachia during his reign. The spreading of the image of the dragon by Vlad Dracul through the large circulation of seal, small coins and heraldic stone carving had a powerful impression on its Romanian subjects. This was increased by the Order of the Dragon necklace, which no other Romanian ruler had worn, and even more so the ceremonial costume of the Order of the Dragon knights - red garments and green mantle. Thus, Vlad Dracul, the father of Vlad Tepes, has forever remained in a bond with both versions of his nickname. This paradox has been interpreted incorrectly. The dragon of the order with the same name was not an evil element during the fifteenth century, but a positive symbol of knighthood. The dragon choking itself with its own tail, which in Occidental St. George heraldry and iconography, from where it originates, represented the defeated Satan, becomes, in the absence of the saint and of the cross, a Christian chivalry order of positive significance. The circular dragon, strangled by its own tail, is represented on the coat-of-arms of many noble families in the Hungarian kingdom who were the descendants of some of the knights who were part of the Order of the Dragon during the reign of Sigismund, until the seventeenth century. This supports the fact that the Order of the Dragon enjoyed great prestige throughout the first half of the fifteenth century. In Transylvania, it also appeared in the coats-of-arms of the families Bathory, Bocskay, Bethlen, Szathmary, Rakoczi and many others, even though the Order of the Dragon had lost its importance after the death of Sigismund of Luxembourg in 1437 and it practically disappeared with the demise of the members who had been admitted by him. Over five millennia of the dragon’s universal existence, it went through many transformations until the fifteenth century and it was known as a fabulous creature, sometimes with the head of a vulture, other times like the animal represented on the Order of the Dragon, with the body of a snake and the wings of a bat. The European Dragon had a lot of sources: Greek mythology (dracon), Roman_Greek tradition, Celtic mythology, the Bible, the Apocalypse, the lives of saints and Oriental influences. During pre-Christian times, the dragon often had a beneficial meaning (often connected with fecundity) and perpetuated in folklore until the late Middle Ages. However, in literature, culture and clerical Christianity, starting from Bibical text, it takes on a different role, and in the fifth century it becomes a symbol of Satan -- "draco iste significat diabolum" (Le Goff 58). This dragon, identified with Satan, was defeated and was dominated by spiritual forces but was not killed; rather, according to the symbolism of Celtic folklore, at some extent, "they even became allied with it" (Le Goff 45), by numerous saints and bishops of the Occident. In the art of Roman influence, the crutch of the bishop often has a defeated and twisted dragon at its tip. Both St. Michael and St. George, whose cult began to spread from the Bizant during the eighth and throughout the tenth, and respectively eleventh centuries, defeated the dragon physically in a fight. In Occidental heraldry, the physical strength of the dragon was said to have been in his head, but also in its big and strong tail, which in the nineteenth century was considered the illustrative element of the dragon. All this European clerical and folklore heraldry, strengthened in a millenary existence (from the fifth century to the fifteenth century) can be identified in the basic illustration of the Order of the Dragon, the snake-like dragon that is strangling himself with his own tail, which, according to tradition, is twisted three times around the dragon’s neck, signifying that he had been subdued by means of Christian spiritual powers, and the dragon with big paws and wings was the symbol of the one who was defeated by the Saints Michael and George. However, we must also remember the fact that, despite the fact that it had been defeated and subdued, the snake-like dragon and the flying dragon still were evil and the symbols of Satan. In the Romanian space to which Vlad Dracul and his son Vlad Tepes belonged, the dragon, named "balaur", a thraco_dacian word, or "zmeu", a slavonic word, had its roots in geto-dacian antiquity, whose military flag was representing a snake with the head of a wolf, included the large category of dragons used as flags, which one finds from the times of the Greeks and Romans until the fifteenth century. This divinity represented on the "geto-dacian" flag, became known in the time of the Roman ruling of Dacia as "draco" (in Romanian "drac" (meaning devil). Along with Christianity, it spread all throughout Europe, and came to symbolize Satan. However in pagan terms, as the Romanian historian Vasile Parvan observed, "out of all the Romance languages, the Romanian language was the only one in which ‘draco’ has the meaning of an evil spirit, demon or devil, whereas in others, the word only has the meaning of snake or dragon" (228-30). In Romanian folklore, even the snake, which in certain conditions, has the ability to turn into a dragon, has a strong malefic meaning. If "Dracul" and "Draculea" have a positive meaning in connection with the Order of the Dragon during Vlad Dracul’s time and later on during Vlad Tepes’ reign, the same words have an exclusively negative, diabolical meaning, synonymous to the Romanian word "dracul" (the devil), without doubt in connection to the bloody and law_enforcing character of Vlad. In 1459, the aspirant Dan III, accused his rival "Draculea" (Vlad Tepes) of collaborating with the Turks, aided and guided by the devil (Tocilescu 71-2), and in 1460 mentioned "the law-offender and barbaric tyrant, unfaithful and the devil that is Vlad Voievod" (Harmuzeki 53). During Vlad Tepes’ captivity in Hungary (1462-1475), the representative of the pope in Buda, Nicolaede Madrussa, declared that he saw "their tyrant Dracul, a name which they [Romanians] use for the Devil" Papacostea (164). In 1486, the author of the Novel about Dracula voievod, translated in Russian, referred to "Dracula in Romanian, and in our language - devil, that’s how evil he was" (Panaitescu 200, 207). Although Vlad Tepes and his descendants have never used the symbol of the Order of the Dragon, he has inherited the nickname of his father Draculea/Dracula, which has become a family name (outside the country). And his successors in Transylvania, the Dracula (Draculea) family kept this name until the seventeenth century, settling in the sixteenth century among the "secui," not far from the place where in 1897, Bram Stoker, located the setting of his novel and the Transylvania castle of "Count Dracula." This way, over a long period of time, from the name of a small pagan deity (Greek, dracos, Latin draco), by means of the name of the Order of the Dragon (in German Drachenordens, Latin Societas draconistarum) to the fifteenth century Romanian nickname of Dracul/Draculea from which the nickname and then the family name, Dracula, comes and was used in 1897 by Bram Stoker, at the suggestion of the Hungarian Jewish orientalist, well known scholar of his time (Florescu & McNally 142-3). If the Order of the Dragon did not exist, with all its symbols and its being awarded to a Romanian Ruler, the name "Dracula" would not be famous today. Works Cited: Andreescu, Stefan. Vlad Tepes (Dracula) intre legenda si adevar istoric. Bucharest, 1976. Calatori straini despre tarile romane. Bucharest, 1970. Cronici turcesti privind tarile romana. Bucharest 1966. Documenta Romaniae Historica. Bucharest, 1977. Florescu, Radu & Raymond McNally. In cautarea lui Dracula. Bucharest, 1992. Harmizachi, Eudoxiu. Documente privitoare la istoria romanilor. Bucharest, 1911. Le Goff, Jacques. "Cultura ecleziastica si sultura folclorica in evul mediu." Pentru un alt evmediu, II. Bucharest, 1986. Nandris, Grigore. "A Philological Analysis of Dracula and Romanian Place-names and Masculine Personal Names in -a, -ea." The Slavonic and East European Review. 36 (1959): 370-77. Panaitescu, P P (ed), Cronicile slavo-romane din sec. XV-XVI publicate de Ion Bogdan. Bucharest, 1959. Papacostea, Serban. "Cu privire la geneza si raspandirea povestirilor despre factele lui Vlad Tepes." Romanoslavica 13 (1966). Parvan, Vasile. "Contributii epigrafice la istoria crestinismului daco-roman." Studii de istoria culturii antice. Bucharest, 1992. Stoicescu, Nicolae. Vlad Tepes. Bucharest, 1976. Tocilescu, Gr G. 534 documente istorice slavo-romane din Tara Romaneasca si Moldova pirvitoare la legaturile cu Ardealul 1346-1603.Bucharest, 1931.